A new report by The Irish Longitudinal Study on Ageing (TILDA), led by Trinity College Dublin, has shown that the mental health of mothers suffered as a consequence of the emigration of their children during the recession. The study showed that mothers experienced increased depressive symptoms and greater loneliness than mothers whose children did not emigrate. The researchers found, however, that with the exception of fathers aged over 65, fathers did not suffer an equivalent decline in mental health following the emigration of one or more of their children. In the year ending April 2006, 36,000 people emigrated from Ireland. By 2009, when data collection for TILDA began, this number had doubled to 72,000 with numbers peaking at 89,000 in 2013. These high rates of outflow meant that a large number of TILDA respondents saw their children emigrate. The study's authors Dr Irene Mosca, TILDA Research Fellow in Economics at Trinity and Professor Alan Barrett, Research Professor at the ESRI and TILDA, used three kinds of mental health measurements including a measurement of depressive symptoms, self-rated emotional/mental health and loneliness feelings and compared the results for mothers and fathers whose children had emigrated during this period with parents whose children had not emigrated. They also controlled for other events which may have impacted on the mental health of the study's participants such as widowhood, loss of close friends and relatives, retirement, unemployment, illness and disability. 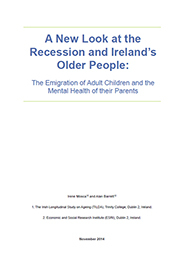 In addition to clear findings on the negative impact of emigration on the mental health of mothers whose children emigrated during the recession, the authors also found that the parents of those children who emigrated were on average younger, more highly educated and had better mental and physical health at Wave 1 of the TILDA study than the parents of children who remained in Ireland.